* Generate 0.25" sparks to a handheld screwdriver! * Light fluorescent tubes without wires! * Build your own Plasma Balls! 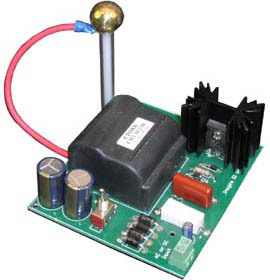 * Generates up to 15kV @ 22 KHz from a solid state circuit! Solid state high voltage power supply is perfect for high voltage experiments, like Kirlian photography. The high voltage at the terminal won't electrocute you, so its relatively safe, but it can burn you, so use caution. Can be run 12 VDC power supply. Click on manual PDF file for more information. Board Size: 5.60" x 4.40" x 5.00"